Virtues of the Right of First Offer, A Check List for the Right of First Offer Clause, and the Lease Clause Critique: A Right of First Offer Sampler. 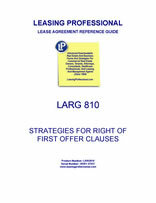 This LARG looks at the Right of First Offer (ROFO)--a contractual right that permits the tenant to expand its premises. The first part compares the ROFO to other common expansion rights, and suggests some modifications the landlord might seek if it must grant the tenant expansion rights. The second section is a check list for ROFO clauses. Next, the Lease Clause Critique contains four separate ROFO clauses with comment. When leasing markets are soft, many tenants have the opportunity to negotiate expansion rights as part of their leases. Such rights can be extremely valuable for long term tenancies, since they allow the tenant to lease just enough square footage for current operations when the lease is signed. If the tenant grows, it is in a position to take down more space without moving to a new building. And the tenant is never required to expand the premises--it's solely the tenant's decision. But while many commercial landlords and tenants have traditionally relied upon rights of first refusal and expansion options to grant the tenant rights to expand, the right of first offer (ROFO) may afford both parties considerably more flexibility since it is not triggered by the actions of a third party tenant (like a right of first refusal), and since it does not contain fixed times for exercise by the tenant (like an expansion option). This means that with a ROFO the landlord controls the timing of any offer of additional space to the tenant. It also means the landlord controls the content of the business deal for the expansion space. These are important distinctions--the landlord should not overlook them if it is forced to negotiate expansion rights with substantial tenants. Rights of First Offer are pro-tenant expansion rights which obligate the landlord to notify the tenant possessing such rights (i.e., the ROFO tenant) that it desires to lease space subject to the ROFO. Although the landlord may or may not have a specific tenant in mind for the space, a ROFO usually requires the landlord to makes a proposal covering the business terms of a proposed lease for the applicable space. With a ROFO, usually no third party deal provides the business terms for the landlord's proposal, which is normally the case with a right of first refusal. If the ROFO tenant doesn't elect to lease the space on the terms offered by the landlord in its notice, the landlord is normally free to try to lease such space to any third party, provided it does so based upon the terms in its notice (or, in some cases, on terms no more favorable than those contained in the landlord's ROFO proposal). Expansion Options which give the tenant a fixed period of time in which to notify the landlord that it wants to lease additional space. The rent for the expansion space may be stipulated in the option, or it may be subject to fair market determination. Sometimes, particularly if the expansion space is directly comparable to the original premises (in terms of location and improvements), the rent for the expansion space is exactly the same as the rent for the original premises. In such cases, the expansion space is merely added to the definition of "premises" contained in the lease, and the tenant's rent and pro-rata share of operating expenses are adjusted. Rights of First Refusal (ROFR) which give the tenant the right to lease additional space triggered by the actions of third parties, (i.e., other potential tenants seeking to lease space in the same office building or complex). Garden variety ROFR clauses give the benefited tenant a period of time to decide if it wants to lease the space offered by the landlord to the third party tenant on the same terms and conditions applicable to the third party deal. In many cases, the ROFR has a revival feature like the ROFO--if the ROFR tenant doesn't take the space, and if the landlord does not make the deal with the third party tenant within a certain period of time, the ROFR "revives" (i.e., the landlord must again offer the benefited tenant the right to lease the space prior to making a deal with a third party tenant).